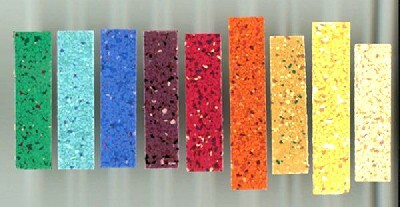 I was approached by a marketing company whose client specialized in commercial flooring. It was the seamless type often used by hospitals. They were introducing 10 new colors for their next sales season, and wanted all of their resellers to learn about the new colors. A promotion was put together and I was contacted. 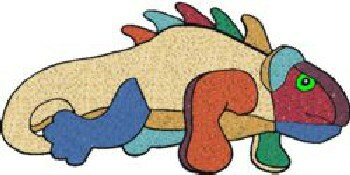 In the past, I had made different coloured chameleons for this same flooring company since that was their mascot. Their message? That their product could blend effortlessly into any environment. This time though they wanted to send me 10 pieces of 2″ x 2″ flooring samples, one of each color, that would be incorporated into the new toys. I calculated the weight, shipping, and logistics of getting the project completed how they wanted. The costs added up quickly. My suggestion was that I would scan each tile into the computer, print rolls of material to match the new flooring choices, and cut the chameleon out of those pieces. The trick was to make sure that each toy had at least one of the new colors on it. I made up sketches to represent what the real toy would look like. It gave the client an idea of what they could expect of the final product. I find that it is always best to maintain a steady chain of feedback from the customer so that they know what’s going on, and they know beforehand, what the next step will be. Because the custom material was going to be costly if the first run of material wasn’t approved, I made up a sample using solid colors I had in stock first to give the client an idea of what the final toy would look like. It would be expensive if I made all of the custom material, sewed together a sample for approval and the customer didn’t like the way it looked, so using the solid color material gave us a real indication of the final look. With an approval on this sample, I ordered the full custom materials. When the material arrived, I made a new sample and sent it to the customer. They loved it. 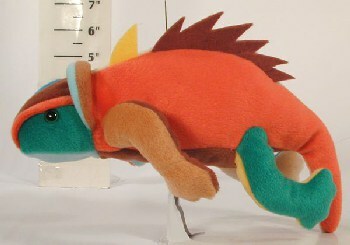 Production was approved and the whole army of chameleons was underway. It was a great idea, and the customer was thrilled. It saved them thousands of dollars in handling and materials, and still delivered the message they wanted. I packaged each one in a triangle mailer box along with marketing materials. 50,000 chameleons later, I shipped them off with breathing holes in each box, [toy chameleons need some fresh air too :)] to the fulfillment house where they were individually labeled and shipped off to the clients.